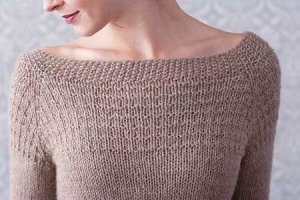 Taken from Knit.Wear - Premiere 2011: "A plush basketweave knit/purl texture patterns the yoke and deep cuffs of a simple boatneck pullover." This pattern is in Knit.Wear - Premiere 2011, page 67. Size US 7-24" circs, US 8-24" circs, US 8 DPNs, and US 7 DPNs (or size needed to obtain gauge) are required but not included. Finished Bust Measurements: 31.5 (34, 36.5, 38, 42, 47.5, 50)". Color Shown is #6214 Oatmeal. $104.00 -- Kit price including yarn only (no book or pattern).